Imagine a dream location for you and your loved one to elope. A place where everything comes together effortlessly so you can revel in the beauty of your special day. From tropical bouquets, grassy lawns and stunning vistas, sandy beaches, endless ocean, and perfect sunsets, whatever your dream may be, make it a reality at the Holualoa Inn. 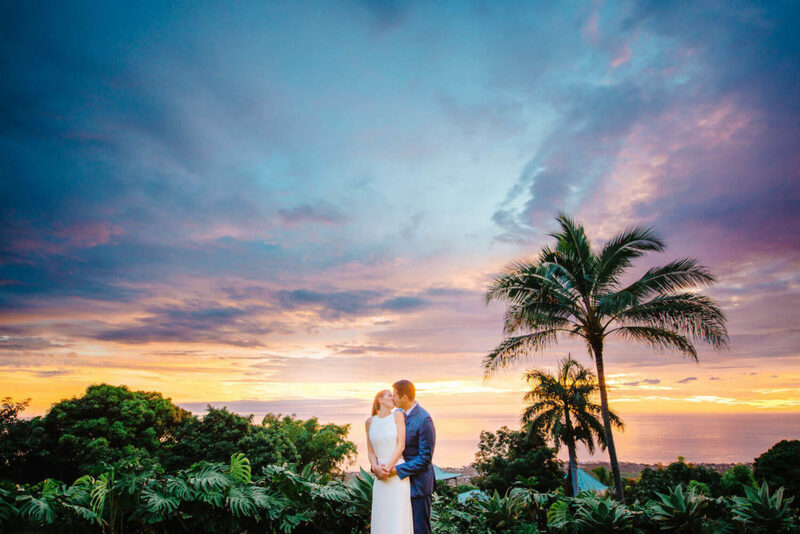 Here are just a few reasons why you should say “I do” at our Big Island wedding venue. 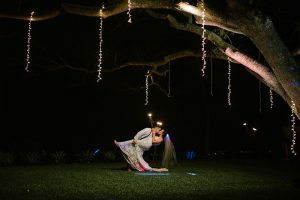 Choose from any of the stunning locations at our 30-acre mountainside estate to take epic photos or to say “I do.” Located at 1500′ above sea level on the verdant slopes of Mt. 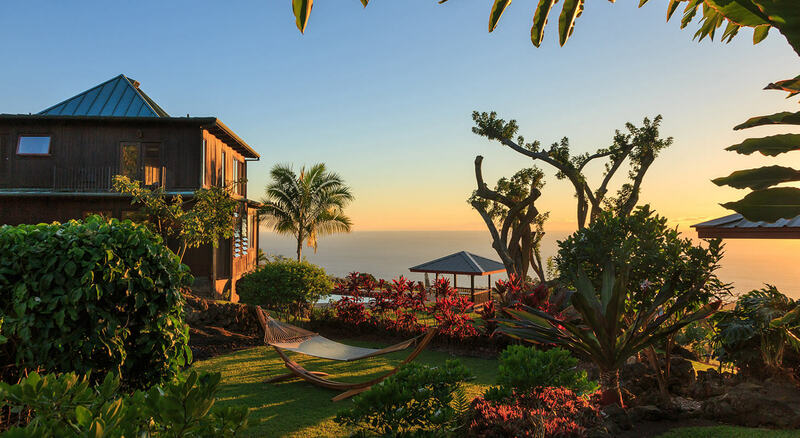 Hualalai, the Holualoa Inn estate is brimming with tropical flowers and is perfectly situated for awe-inspiring views. We offer a variety of sceneries including 360-degree vista views from our rooftop gazebo and a sweeping backdrop of the Kona coastline. You can also choose to have your toes in the sand at a secluded Big Island beach or the subtle beauty of our Blue Jade garden. You can choose the perfect location for your ceremony. The Holualoa Inn itself was originally built as the private vacation residence of a newspaper tycoon in the 1970’s. The interior and exterior of the Inn feature finely-crafted, locally-harvested hardwoods and intricate, traditional lauhala weaving. 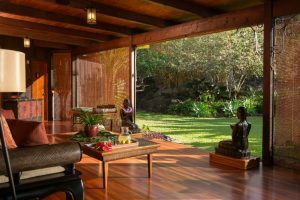 The main house has an open layout which takes advantage of the constant mauka and makai breezes to keep the house cool and comfortable. There is no shortage of airy balconies with spectacular views. The exterior of the Inn features a mosaic-tiled swimming pool and a covered hot tub perched above a scenic vista. The interior of the Inn and all of the guest rooms, the Darrell M. Hill Cottage, and the Red Barn are uniquely appointed with Balinese hardwood furnishings and local Balinese art acquired by the owner. 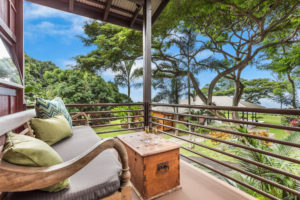 The 30-acre Holualoa Inn Estate is located down a private driveway in a small artist’s village above Kailua-Kona. That means there is little going on to disrupt the sounds of the gentle ocean breezes rustlings the trees and the sing-song calls of tropical birds. The Inn has six guest rooms within the main house, as well as the stand-alone Darrell M. Hill Cottage and the Red Barn. Even at full capacity, the property never feels crowded and you can always find a place to be alone. With six guests rooms in the Inn, as well as a Cottage and a Studio Barn, you can choose the accommodation that is right for you. Both of our private, stand-alone accommodations include breakfasts, full access to the Inn, and are just a short stroll up the driveway. You can also stroll the neighboring Holualoa Village and visit the Artists Galleries or the excellent Holuakoa Gardens & Cafe for lunch or dinner. The main town in West Hawaii, Kailua-Kona, is less than ten minutes by car. There you can explore some of the beautiful beaches along Ali’i Drive or some of the other great dining options around town. 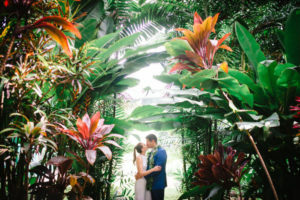 With a variety of signature packages, enhancements, and à la carte options from which to choose, you can turn your destination elopement in paradise to a romantic Big Island honeymoon. Go on an adventure by air, land, or sea with one of our trusted partners, or stay behind at the Inn and relax with a private yoga lesson or couples’ massage at our secluded Hale Luana Pavilion. Just choose your adventure and let us take care of the arrangements. 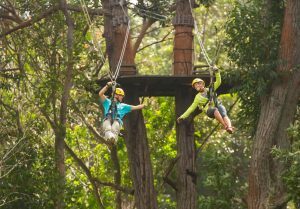 Even if you just want a picnic lunch to take along with you to a quiet beach, we are here to make sure you get exactly what you need to make this the best Hawaii honeymoon. Planning an elopement can be stressful, especially when you are making the arrangements long-distance. We are here to make sure the experience is as stress-free and effortless as possible. Simply choose one of our Signature Elopement Packages, and we will provide a wedding officiant, traditional wedding leis, complimentary champagne for toasting, ceremony coordination, and guidance and assistance with any additional arrangements you may need to make. That way you can focus on what really matters — sharing the excitement and romance of your special day with the one you love.